Keeping and breeding tropical fish outdoors in the warmer months is a practice as old as the 100-year-old tropical fish hobby itself, according to experts at the North Jersey Aquarium Society (NJAS). Homeowners interested in breaking into the hobby should start small with tubs on their decks or patios. Once the tub is in place and the climate is right it’s time to begin introducing plants such as dwarf water lilies, iris cattails, water hyacinth, and pickerels. In June families can start adding white cloud mountain minnows, rosy barbs and zebra fish to the tub. If you want fish to breed in your container include livebearers such as platies and guppies. The number of fish you place in the water depends on the size of the tub. Ted Coletti, a tropical fish hobby expert and a member of NJAS, recommends placing about six very small fish in a 25-gallon tub. Throughout the summer the plants and fish will thrive, and nature will introduce some delightful surprises. 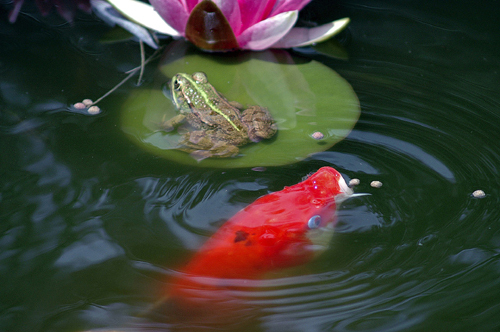 For example, tree frogs might decide to hang out on top of your lily pads. If these delightful critters spawn in the tub they will add tadpoles to the ecosystem. Start small with a free-standing 34 to 40-gallon tub. A container with shelves allows for different plants. Decorative 25 to 50-gallon planters to match your deck décor also work well. A large deep tub will weather varied conditions better than smaller receptacles. A fish’s stomach is about as large as its eyeballs so feed accordingly. A few pellets once a day is plenty for small tropical fish. Their diet is supplemented with algae and insect larvae in the tub. 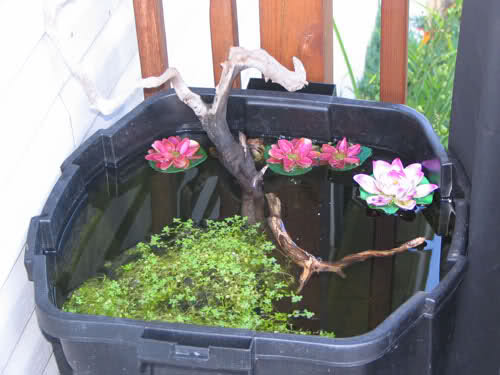 As long as you don’t overfeed your fish, the plants will naturally keep the water filtered and aerated. Tropical fish need to be brought inside around October. If you don’t have access to an indoor aquarium, consider giving the fish to your local aquarium society to be auctioned off to members. Source: Ted Coletti of the North Jersey Aquarium Society. Next Next post: Thinking about Bringing Home a Pocket Pet? Here’s What You Need to Know.